Whether for business or for private stays, for short or for long term, we offer bright, spacious rooms and apartments at attractive prices. Take advantage of the amenities of an apartment with long-term stays (long-term living) for several weeks or months at a time. From the first day, lodge in a pleasant atmosphere in a quiet city location. So that you feel comfortable with us, an inobtrusive atmosphere provides for peace and relaxation. Conveniently placed with regard to transport facilities, our hotel offers a very comfortable setting for your activities. The direct connection with public transportation to many places of interest and to the nearby exhibition centre with its world-renowned trade fair events will make you glad you stayed here. Use our 360° panorama views to gain some insight into our hotel. 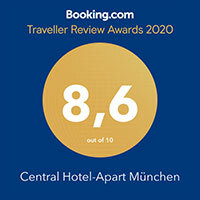 We look forward to receiving your enquiry and to welcoming you to our hotel in Munich. Sorry, no offers to display. Please check back later.